Splash pages - you gotta love 'em. A place where the penciller can hit the reader full-throttle, with a large dose of illustrated 'wow'. IADW has been a bit too DC free lately, so what better to even the scales than a Dan Jurgens drawn splash-page from Superman #75? Dan is my favourite Superman artist period. While I have never met the man himself, applying for design school, I'll never forget how the head professor lit up and dashed off to her office when I said in the interview process one of my influences was Dan Jurgens - returning proudly with wads of books he had illustrated. Opening a copy of Zero Hour she showed me a message written by Dan himself that read along the lines of 'Dear Hazel, Thank you for all your lessons. Without you I would still be drawing in the funny-books. Dan Jurgens' You could've knocked me over with a feather. The woman who taught Dan freakin' Jurgens was now in my country and ran the school I was applying for?! I had to get on this course! That was the year 2000 (hence the paraphrasing), and even 10 years on I still remember how stunned I was seeing that note. Two Dans - one teacher - who would've ever thunk! 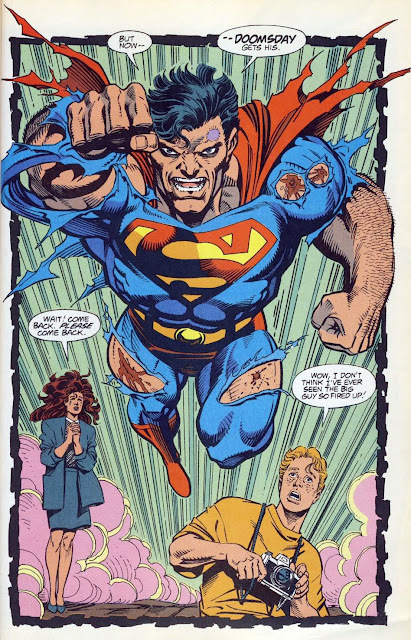 Dan Jurgens is a prince of a fella. I met him back in 2006, and we've been chummy and conversational since. We check in on each other every so often, especially round this time of year, when fantasy (American) football gets moving. Thanks for those great comments Doug! I have an interview in my scrapbook Dan did with Wizard Magazine when he was on Thor and he comes across as a really decent dude - (the interviewer gets trapped and Jurgens helps him out). Seeing him in Superman #700 was awesome too. As for fantasy football that's just finished here, but our 'football' is soccer - I only managed a measly 2nd after riding 1st in our pool for most of the season! Robbed I was! Hope you fear better than I!